This visualization provides an informative summary of the quarterly seasonal global weather and climate using the 3-D Science on a Sphere format. These video summaries use animations of recent NOAA data and an engaging commentary to review the climate highlights of the past 4 seasons. Topics include, El Nino/La Nina, temperature trends, extreme weather, and emerging climate research. This tool would also be very useful for college level. Earth is constantly changing as energy flows through the system. 2.1 Changes in energy flow over time. Water plays a major role in the storage and transfer of energy in the Earth system. 2.4 Water stores and transfers energy. Physical processes on Earth are the result of energy flow . Teacher resources are not available but visualization can easily be incorporated into curriculum, units, or activities. This visualization summarizes information from the seasonal climate reports put out by NOAA. Educators can download this information and run it on the Science on Sphere platform, read the information online, or view it in Youtube videos. The site has up-to-date information from the most recent climate report from the previous four seasons. There is no access to previous years. The videos tie in research, for example including information about tropical storm speeds, so it is more informative than just a digest of weather events. This resource is useful for providing a comprehensive summary of the latest climate report information from NOAA. 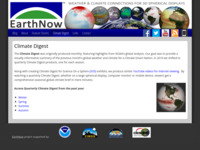 Educators can use it to explore the climate-related events that occur in each season. One of the videos has a Spanish language version. The visualization can be viewed online via EarthNow website or YouTube and downloaded from an FTP site link. Links to Science on a Sphere data are also provided, but educators would need access to the Science on a Sphere software to visualize the videos through this format. Teachers should be aware that the four seasonal links provided always appear in the same order but do not link to events in chronological order, depending on what time of year you access them. For example, if viewing the page in late June, the 'winter' video is older than the 'spring' video. They are replaced or refreshed as each new season is ready to display. MS-ESS2.D3:The ocean exerts a major influence on weather and climate by absorbing energy from the sun, releasing it over time, and globally redistributing it through ocean currents. MS-C1.4:Graphs, charts, and images can be used to identify patterns in data. MS-C4.2: Models can be used to represent systems and their interactions—such as inputs, processes and outputs—and energy, matter, and information flows within systems. MS-P2.5:Develop and/or use a model to predict and/or describe phenomena. HS-ESS3.D1:Though the magnitudes of human impacts are greater than they have ever been, so too are human abilities to model, predict, and manage current and future impacts. HS-ESS3.D2:Through computer simulations and other studies, important discoveries are still being made about how the ocean, the atmosphere, and the biosphere interact and are modified in response to human activities. HS-C7.2:Change and rates of change can be quantified and modeled over very short or very long periods of time. Some system changes are irreversible. HS-P2.6:Develop and/or use a model (including mathematical and computational) to generate data to support explanations, predict phenomena, analyze systems, and/or solve problems. HS-P4.1:Analyze data using tools, technologies, and/or models (e.g., computational, mathematical) in order to make valid and reliable scientific claims or determine an optimal design solution.